I'm a big fan of Tufo's tires with their tubeless tubular construction and I've used them for years. So, when these went on sale, I bought them. The ride is great - very supple and very comfortable and seems fast. However, these tires are really pretty delicate. They get cut up pretty fast and it is easy for them to get cut to the cords. I was surprised at how much more delicate these are than any of the other Tufo's I've ridden. I think that's a good comparison since I probably have nearly 15,000 miles on Tufo tires and almost always I ride them until the red wear band or the cords begin to show and they never flat or never have any worse than cosmetic cuts. However, these, cut very easily and in several places after about 500 miles, I have them cut to the cords to the point where I finally replaced the tire before it failed on the road. So, great to ride, just not durable for a tire and I don't think they will go the distance. You'll be replacing them before the tread is gone. I bought these on sale, and that makes them a great deal. 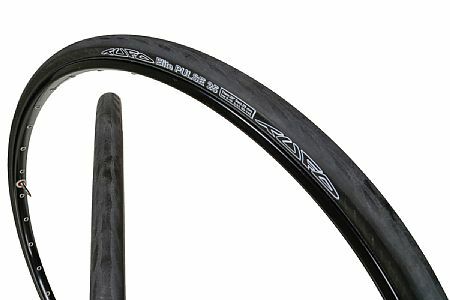 The tires don't ride as smooth as a Vittoria CX III tubular , but the fact that it is a butyl tube bonded to the casing makes it far more likely to seal permanently with sealant. I had a flat at about 1500 miles, put in some sealant and rode them for another 400 miles until the red protective belt started showing at 1950 miles. Another puncture sealed fine at this time , but I decided to change the tire (rear) , as the indicator strip was showing. The front tire is still going strong at 2100 miles , without much wear and has had no punctures. I do like this tire because of its nice grip and durability. But Im not sure its a good tire for wet condition. Very comfortable tubular, smooth ride. Racing and training. Almost 2000km so far. Seriously fast rubber that makes you fly. At first, I was hesitant to use Tufo tires because of the bad reputation they have on the Internet (being slow, giving harsh ride etc.). However, after a season on Continental Competition tubulars, I was looking for something that would result in a more comfy ride. The Competitions were not perfectly round and no matter how I tried to seat them, they always produced a bumpy ride. I ran the Competitions at 105 PSI and this pressure (72 kg rider) seemed to be the best compromise between comfort and speed. Nevertheles, at the end of August I was just fed up with the bumps and went for Tufos as they offer a seamless casing. The difference was apparent at first. The bumps disappeared. However, the tires were slow (at 120 PSI). As riding the Competitions was deadly when I once tried to ride them pumped at 130 (no grip while cornering, very harsh ride) I was not sure if it was a good idea to try a higher pressure. But I did try and what a transformation! I ride the Tufos at 150-160 PSI and they are seriously fast, grip well and provide a supple ride comparable to Continental GP4000S clinchers (one of the best clinchers ever) pumped to 110 PSI. I cannot comment on durability as I clocked 1000 km only, but the ride quality and speed are excellent.